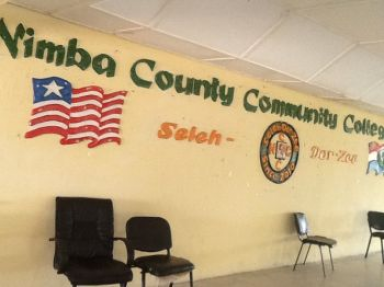 Report from Nimba County indicates that the Nimba County Community College (NCCC) is craving for the College to be elevated to a full-fledged University status after certain things have been put in place. According to information gathered from our correspondent in the county, the new President of NCCC, Dr. Edward Lama Wonkeryor told newsmen that his administration is well on course to ensuring that the dream by the people of Nimba to have their community college become a university is actualized. Nimba County Community College which he said was established in 2011 by the Government of Liberia to provide quality education for people in Nimba and other rural parts as required by the National Commission on Higher Education (NCHE) which according to him, now requires upgrading; and in return will academically boost the morale of the elevated college to a University status. He said an application has already been sent to the NCHE for the NCCC’s upgrading. Following the submission of application to the NCHCE, he said what is left, is the assessment team from the Commission to visit and do an inclusive assessment of the institution, to determine the validity of the request made to enable the institute to assume the quality of a full-fledge University. After the assessment, he said the institution will be given a temporary university status, while on the awaiting list and enactment by the Liberia Legislature to make the institution a full-fledged university. Dr. Wonkeryor, who is former President of the Tubman University in Maryland County, explained that as part of the strategic plan of the college, his administration has embarked upon the recruitment of qualified instructors with advanced degrees in various areas of disciplines. He said the college is also exploring the possibilities of sending junior and senior faculty members to pursue advanced degrees abroad, including the United States, South Africa or at the Kwame Nkrumah University of Science and Technology in Ghana as well as the Cuttington University and University of Liberia respectively. Commenting on infrastructural development at the NCCC, Dr. Wonkeryor disclosed that the Liberian Government has given the college a grant of US$500,000.00 for the construction of staff housing and a dormitory to host students and teachers coming from outside of Sanniquellie. Why Weah? -Amidst Troubled & Backfire Appointments; Where Are The adviser And Consultants?